A2ZLyrics is a browser add-on which you should remove from the PC if you want to prevent advertisements. The application displays the songs’ lyrics next to the YouTube videos, but it is also classified as adware because of different advertisements that are inserted to the website. A2ZLyrics is available at a2zlyrics.co, but since it is known by some different names, the same application can be downloaded at electrolyrics.co, lyricsbuddy.co, and some other website. The browser add-on works on three most popular browsers –Internet Explorer, Google Chrome, and Mozilla Firefox, and if you want to remove A2ZLyrics from the system, keep in mind that it is not enough to disable the application. 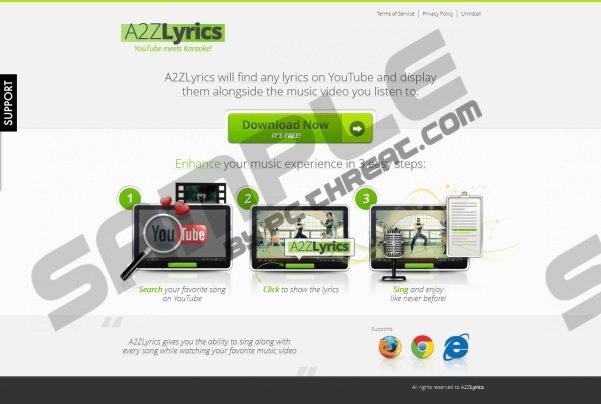 A2ZLyrics can provide you with various advertisements. Their content depends on the clients of the advertisers which use A2ZLyrics for distributing their ads. You may be invited to read articled on healthy food, play online games, buy jewelry, install a computer application, and the like. The owners of the application do not monitor the advertisements and do not follow the actions of the third-party websites. It implies that that insecure websites can also be promoted by A2ZLyrics ads. It is very important that you not expose your personal information on unfamiliar website; moreover, do not download computer programs from the sources about which you do not know anything. First find out whether you can trust the website or not and then act accordingly. The application does not seek to reveal and share the information on your identity, but it does collect non-personally identifiable information. It can determine the country that you are located in; it can monitor your search terms and read your browsing history. The data collected is then used for advertising and marketing purposes, which means that at some point you may be provided with more personalized advertisements. The third-party websites that are promoted through A2ZLyrics pop-ups, in-line advertisements, and web-banner may also collect information about you. As for the removal of A2ZLyrics, we recommend that you implement SpyHunter. The application is a powerful anti-spyware tool which can eliminate the application from the PC and safeguard it against different computer threats, including other adware programs, browser hijackers, Trojan horses, and rogue anti-spyware programs. If you do not have a reliable computer security tool, do not risk your privacy – act right now. Click Control Panel and the select Add or Remove Programs. Since A2ZLyrics can collect information about you using cookies, you should scan the PC to find out what files related to this application have to be removed. Click the button below and download a scanner. It will thoroughly analyze the system and provide you with the search results in no time. Quick & tested solution for Adware.A2ZLyrics removal.